Digital publishing platform for quickly sharing text-based documents and publishing simple blogs. Pros: Write.as facilitates up to unsuspected limits to maintain a blog without worrying about anything other than writing. It allows you to publish articles in a blog with your brand but also write them anonymously. You have a blog for free but you can also choose more with payment plans, as well as access to more features such as personalizing the blog. 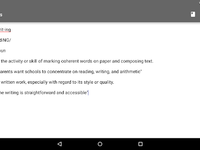 It also supports the Markdown language, which speeds up the formatting of the text as you type. Finally, beyond being able to share your articles, Write.as allows you to federate the blog so, apart from the url, you also have a user id in the "fediverse" and your publications can be followed from any social network that integrates the ActiviyPub protocol like Mastodon, Pleroma, Friendica, Hubzilla, etc. Cons: In the simplicity of Write.as there are also some of its shortcomings. The possibilities of personalization of the blog are minimal and only through a payment plan you can activate personalization through CSS. Those who are used to other platforms such as Wordpress may be lacking to have plugins that increase functionality. As for sharing content automatically in other social networks, Write.as allows it with Twitter, but other social networks are missing. The hosting of images must be done in a third-party service or with Snap.as complementary service with a payment plan. Likewise for the moment the publications must be made from a web browser, including writing from the mobile, since until now the available applications do not allow logging in with the account but only making anonymous publications. 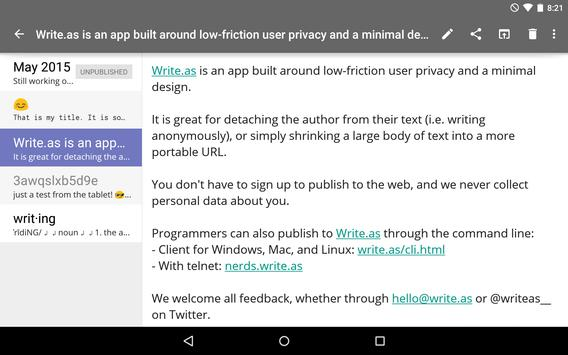 Although Write.as has announced that it is working on the second version of the Android application. It does not have a tool to import the content of other blogs so if you want to make the jump you will need to copy each entry by hand. Finally Write.as, at the moment, does not have a comment system, although it is in development. So whoever misses the interaction with the readers should include in their publications a profile of another social network or Slack style tool where they can be made. Overall: At the moment my experience with Write.as has been very satisfactory knowing that it is a platform that is taking its first steps. I was just looking for a new blogging platform tired of the neglect of Blogger, which allowed me to focus just on writing and, if I wanted to pay, it was something more affordable than the prices of rivals like Wordpress or Ghost. In addition, as a follower of the "fediverse" with all its connected networks, I was attracted by the fact that my blogs could be part of it. After trying the free blog I made the jump to move the rest of my publications from other platforms and centralize them in Write.as. In addition, the times that I had to contact the support service to resolve doubts and even an error that I made due to ignorance, the attention has been excellent and quite fast. 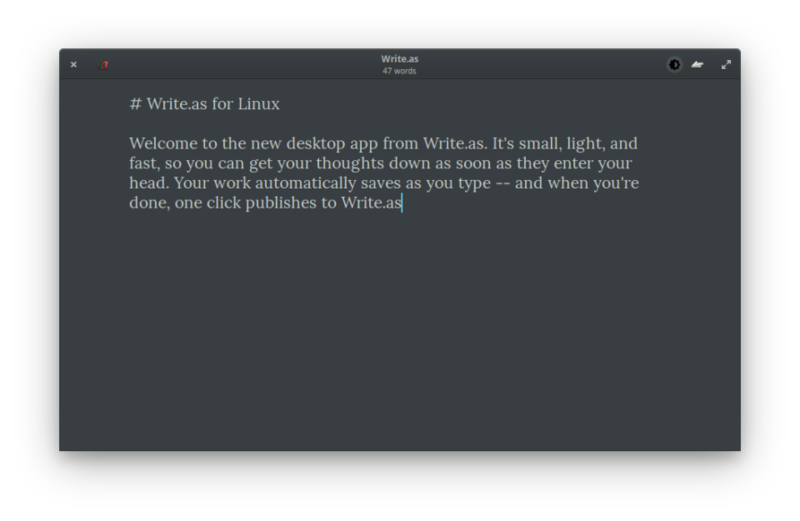 Software that allows you to just write. Pros: This answered almost all of the issues I had with other blogging platforms or CMSs on the market today. Most online software and services that claim to be writing software or blogging software are so bloated and bulky and require so much backend knowledge and work. Write.as is super simple. You log in and start writing. There's no server stuff or plug-ins or site settings to worry about. It's not for everyone, but it's not built for everyone. It's purpose-built for people who want to just sit down and write. Upgraded plans are affordable and feature-rich, our rep is super responsive in the community and for support questions. If you're looking for a simple way to write something and publish it to the web, either anonymously or to a personal website (yes, you can publish anonymous articles or set up a custom domain), this is the website for you. There's no hassle with a minimalist interface that is a breath of fresh air compared to the competition. It's simple and sleek, yet very customizable (with a pro upgrade). Cons: It's a small team, so new features are slow to come, but our rep is a rockstar and is constantly releasing new related projects, fixing bugs, and adding new features while keeping the whole project simple and not adding extra bloat. Analytics could be a bit better for personal blogs. The workflow for draft posts was a little strange to get used to coming from a traditional CMS (Wordpress), but it makes sense after you spend some time with it. Overall: I was looking for a simple, minimalist way to publish a simple blog. All I wanted to do was customize a few options (font, background color, headers, etc.) and then log in and write. Write.as provided a fresh experience when compared to bloated or overly technical CMSs and blogging platforms. There's no backend stuff to manage, no admin settings. Now instead of spending hours managing the admin side of my blog I spend a few minutes tweaking settings and checking analytics, and spend more time writing, editing, and publishing. Best simple writing and publishing platform on the internet right now. 6. Though I have not used this feature a lot, you get to post anonymously as well! 7. Slack channel to interact with the creator! And he is responsive! Cons: Since it is highly minimalistic and the platform is still improving there are some features which are not supported out of the box. I wanted to have a plugin which shows up all the categories of posts I had written on the RHN. I asked the team for it. He did add the feature in the backlog of his requests. Since it is a one-man show I understand the new features will take time to come. I am okay with it since I love the platform and the promise on which it delivers. Overall: I have used WordPress/Blogger/Tumblr/Posthaven and a few more and last year I finally made the switch to Write.as. I am happy with the platform and look to grow with it in the future. Keep rocking, team! Pros: This was the only blogging platform I used that really focuses on writing. The distraction free interface is beautiful, elegant and totally inspiring. I love that there are no ads, no plugins, no crazy customization settings to go through. It's right to the point: an inviting space to write. It offers the essential and that's impressive in today's noisy online world. Also, privacy is taken pretty seriously. It's one of those softwares that I'm happy to contribute to with a yearly subscription because it's really well done. The team is small and works really hard to improve things. Cons: There are some features that are still being developed like: allowing for a markdown text preview before publishing and the possibility to allow comments. But these are not really essential for me, only a "good to have". Overall: I created my account, saw a blank space where I could write, I wrote and published. Just like that. That was a unique blogging experience! The next day I upgraded to a Pro account and decided to move my personal from Wordpress to Write.as. Pros: The writing interface is clean and perfect for distraction free writing, similar to Draft. It is easy to start a new post and start writing. The editor support Markdown syntax for styling text and providing links, which is a well-known standard and easy to use, so that's a definite plus. The site creates logical URLs automatically, with every post being under write.as//this-is-the-post-title or something similar. It is easy to add posts to blogs, which appear as a simple list of articles with titles, dates and article snippets. Cons: There are no social media sharing links on any articles, though it seems that the new opinion is that those are of dubious value anyways. There are no obvious ways to theme or customize the appearance of the blog, but given this is a minimalist editor/blogging platform, that is actually to be expected. Overall: Overall, Write.as provides a quick, easy, distraction free way to get your ideas out there and share them with the world. And isn't that what blogging is all about anyways? Cons: My one wish is that I wish the syntax was a bit easier to use, or that the syntax guide could be pulled up as a sidebar on the main writespace. Ready in an instant, and knows how to keep secrets. Pros: I can be writing out a fresh thought without being distracted by the process of getting to the app, or the particularities of it's UI. Thoughtless writing! Cons: It's home grown, by writers, for writers. So new features and functions come out in good timing, but not so promptly that you can set your clock by them. Which proves it's built by writers. What?! You expect a writer to actually meet a deadline?! Overall: Like my first kiss. My first paycheck. The first homerun I ever hit. Like Janet Jackson's wardrobe malfunction. Like and evening alone with Louis C.K. Pros: What I like most about this software is the simplicity of its use and configuration. I value very positively that the privacy and the anonymity of the user are taken seriously. The price to pay for the plus versions are very affordable and it is worth paying for them. The company is developing new tools to improve the user experience. Cons: What I liked least at first was that you have to learn the Markdown language, but then you appreciate it because it makes writing a lot easier. I am missing the possibility of seeing a previous version of your publication before publishing it. Overall: The general experience using write.as is very positive. It has the features I seek, which are: simplicity, privacy, anonymity and strength. 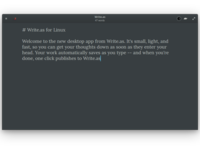 Overall: I have been using it for two years and i truly enjoy how easy it is to visit write.as and just start typing away. It is also privacy-centric, so I can set any or all of my blog posts to anonymous should I choose. Cons: There is hardly anything to fault about Write.as. I love everything about it. Pros: Write.as makes it one-click simple to get your thoughts out into the world. the connection between who you really are and what you write is as tenuous or as firm as you want it to be; meaning you can publish effectively anonymously, or entirely eponymously. Cons: write.as goes for minimalism and obtains that goal, but it may be that it's a little too minimalist. However, this is simply a difference of style, not a real indictment of the product. Write.as remains one of the most useful writing tools in my workflow. Pros: I like the possibility of writing without any distraction, because the interface is clean, organized and I can put out the ideas that I have in mind. In addition, it is also possible to buy a subscription (which costs cheap) to have a domain of its own and further customize the experience. Cons: It is not yet possible to have a comment box in the posts. I think this is important, especially when it comes to blogging. Overall: Overall the experience has been good. I use write.as more as a personal journal of some ideas I have. 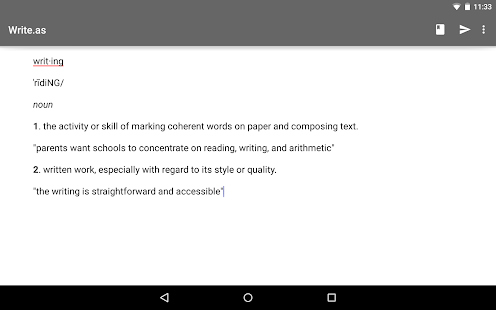 Pros: Minimalist and distraction-free approach to writing, on an accessible platform. The writing takes centre-stage, and there's a focus on little else, unlike most of the available blogging platforms out there nowadays. Cons: The lack of an ability to engage with readers. A comment system is in the works, but has yet to see the light of day. Overall: Was seeking a place to post stories and articles that wouldn't fit my main blog. 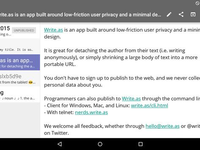 Write.as functions perfectly as an alternative that's easy to get off the ground and manage. Pros: It's Open Source and Community-driven. The prices are really affordable, especially considering how fully featured it already is (custom domain with SSL, Markdown). The UI is lightweight and elegant. Cons: There were couple of small features that I wish it already had: better out of the box customization, better preview mode. As far as I know, all of them are already in the works. Overall: I am very happy customer. It's a perfect platform for my small personal blog. Pros: Everything about Write.as is simple, and simple is good: the user interface, the presentation, the pricing plans--everything! The ability to create different blogs/identities on the same pricing plan is perfect for the different hats I wear. Cons: It has a very simple feature set that might not satisfy serious or enterprise bloggers. Pros: write.as is what I used to get out of an old Stacey text only blogging platform that I loved. It let's me author without complex admin interfaces, keeps the focus on the writing and gets out of my way when I'm actually writing. It's far simpler to manage as well than tools like wordpress, blogger or medium. Cons: Managing multiple sites/blogs is a bit non-intuitive. Overall: The problem I wanted to solve was how to have a very simple and attractive place to write and post my writing that highlighted the writing and kept admin to a minimum. Cons: No issue has come up while using write.as. It's a smooth one. Overall: Blogging experience with it is totally great. Pros: I love the design and distraction free when writing in their editor. Cons: iOS app doesn't let me log in to my account. Pros: Absolute simplicity. Absolutely beautiful interface. Nothing unnecessary, nothing cluttered. This is like the anti-wordpress. It also has a super neat feature that you can follow it using mastodon. Cons: By default, no option to upload pictures, though this is provided with the Pro version. That's understandable; pictures are bandwidth-intensive. Overall: It's an excellent simple powerful piece of software. If what you want to do is just plain write, it's hard to beat. Pros: Write.as is as simple as can be. The pricing is spot-on for its feature set. I've used WordPress, Tumblr and Ghost across a variety of sites. Considering the costs of a plan, Write.as has all the functionality of the three - without the crap. Cons: I wish there were a very more ways to structure content on the homepage. An additional of a block that can used to direct readers to, say, a mailing list or off-site webpage would be great. Pros: I love the simplicity of Write.as. It truly is "distraction-free" writing that puts a focus on the words instead of multimedia, advertising, etc. Cons: Though smart users will figure out how to do certain things, it would be nice to have some basic formatting abilities (bold, italic, etc.) available from the writing module (if desired by user). Pros: The clean look of write.as, designed to concentrate all your attention in the writing. Cons: You have to pay for having mor words on your post or having more than one blog, but it worths anyway.